Onyinye Akunne who killed her husband, Abuchi Akunne, 35 years of age, with a kitchen knife as they got into argument over lotto tickets widely called "baba ijebu" at No.85, idimu rd, Ejigbo, Lagos, where they live, on March 28th, 2015 have been sentenced to 7 years imprisonment at the Ikeja High court. She was found guilty by the court as the presiding jugde, Justice Josephine Oyefeso, sentenced her to prison for committed murder. Justice Oyefeso refused to the plead to send her to community service, as she was sent to the prison instead. “In view of the defendant’s pleading guilty, I hereby find her guilty of one-count charge of grievous bodily harm. I hereby sentence her to seven years in prison starting from the day she remanded in prison custody which was March 28, 2015,” Oyefeso said. Akunne's counsel, Mrs P.O Onu, pleaded with the court before the sentence, saying she is a mother of 1-year 7 months old baby. “The defendant is a first-time offender, she is a mother of a toddler which she gave birth to while in prison custody. Her daughter is a year-and-seven months old, she still has a lot to offer to the society” Onu said. Justice Oyefeso asked her relative to take care of Akunne's daughter who has been with her in the prison. Mrs C.K Tuiyi-Carena, Lagos state prosecutor, explained to the court how Akunne killed her husband. “On the day of the alleged murder, Onyinyechi was preparing a meal while Abuchi was sitting on a chair in their home looking at his “Baba Ijebu” lottery tickets. Angered by her husband’s action, Onyinyechi scolded him for his love for gambling and a fight ensued between them. She took the kitchen knife she was using to cut vegetables and stabbed her husband fatally in the chest. The stabbing inflicted a deep cut in Abuchi’s chest which led to excessive blood loss and his eventual death. The victim died before he could be taken to a hospital by Onyinyechi and concerned neighbours,” she said. 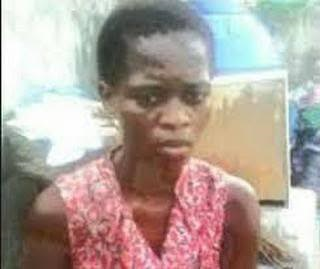 The offender was pregnant when she committed that crime and she delivered her baby in the prison at kirikiri.